"Agriculture and seeds provide the basis upon which our lives depend. We must protect this foundation as a safe and genetically stable source for future generations. For the benefit of all farmers, gardeners and consumers who want an alternative. We pledge that we do not knowingly buy, sell or trade genetically engineered seeds or plants. The Safe Seed Pledge is a voluntary pledge, and there is no oversight and management of those who have taken the pledge. We trust those who sign the pledge that they are being honest about not selling GMO seeds. If a seed company sells organic seeds you can be assured that they are NOT selling GMO seeds. However, it's worth recognizing that simply taking the pledge doesn't mean that a seed business isn't doing business with Monsanto. It's also worth noting that taking the pledge does NOT mean that a company isn't still doing business with Monsanto since Monsanto owns approximately 42% of the of the home vegetable seed market. This means that many popular tomato varieties, (i.e., 'Lemon Boy', 'Early Girl' and ''Celebrity' tomatoes) are owned by Monsanto. 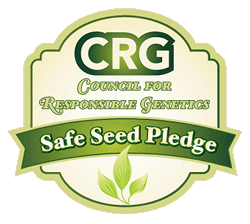 Since the Safe Seed Pledge is more a statement about what a company stands for, making this pledge is really just making a public stand against the practice of using GMOs in our growing our foods. TomatoFest seeds are all Certified Organic. Since we started business in 1992, we have been among the leaders in utilizing only organic practices for seed harvesting and distribution.